It’s time to look for the right vendors! What do you need for your event? Catering? Bar service? There are so many different elements to think about. If you’re not sure where to start, we love giving recommendations! Everything from live muralists to catering — we’ve got you covered. To keep it all on track, start by creating a checklist of all the pieces that need to be in place before event day — including the dates that each element absolutely needs to be confirmed by. If it’s a major conference or festival, we’re talking at least a year-long timeline. For smaller events, give yourself at least 6 months. This way, you have ample time to reach out to vendors and can anticipate a bit of back & forth before committing. The budget is a key piece of the puzzle that needs to be set in stone (aka a set amount that you’re willing to spend) before you move forward. We suggest creating a spreadsheet with every possible expense as a line item. Include two columns, one for “Budgeted Expenses” and another for “Actual Expenses” so that you can account for what you were prepared to spend versus what the element actually ends up costing. Include a column for payment dates — the last thing you want is to pay more in fees because you missed a deadline. If you have no idea what things cost, start by reaching out to some of your preferred vendors and ask for estimates! 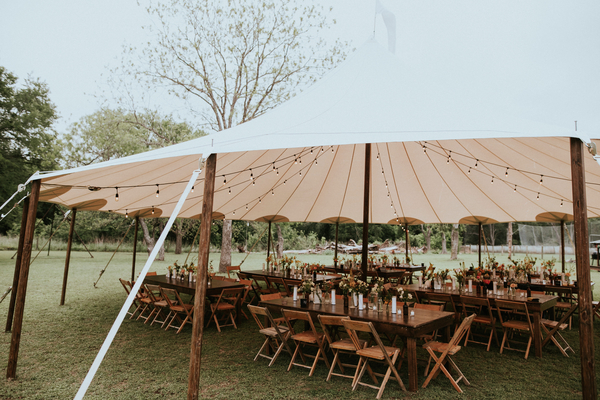 In the estimate, you’ll have what’s included in the price and begin to see the average cost of your venue, caterer, and event rental options. Be sure to prioritize your budget by what you value! For example, if you know that you want people to do a double take at your florals, then there may have to be a little give in the catering department. It is strongly advised to have your venue confirmed before falling in love with specific rentals, as the event space dictates what you’ll need. If you have a venue in mind, but would like to visualize the space before committing, please reach out to us! We’re happy to create a custom design board for you so you can really see how things will come together. We also have ready-to-view lookbooks for a few of our favorite Austin venues that will help you picture how it will all come to life. The event rentals you’ll need can include tables, chairs, lounges, decor, and tabletop pieces. Really anything that the venue does not provide, but that you’ll want in order to put on a memorable event. In terms of when to book event rentals, know that some of our best-renting pieces like the Ramos Bar, Old Pal Chairs and Sazerac Sofa are often booked out two months in advance. While we have multiples of these rentals, we definitely want you to have plenty of options and not be limited by what has already been spoken for. If you’re eyeing our pieces, start building your Moontower Wishlist 1-2 months before the event. During the busy season (late February to May and early September to the beginning of December) we suggest booking earlier. If you’re in a bind, we’re happy to try to accommodate you last minute—you’d be surprised at what we can pull together! We hope you’re more comfortable with the idea of creating your event checklist, setting your budget and now know when to book event rentals. If not, reach out—we don’t bite…hard 😉 We’re eager to get this party started: info@moontowerrentals.com.